Today started and ended as a sunny day full of blue skies. 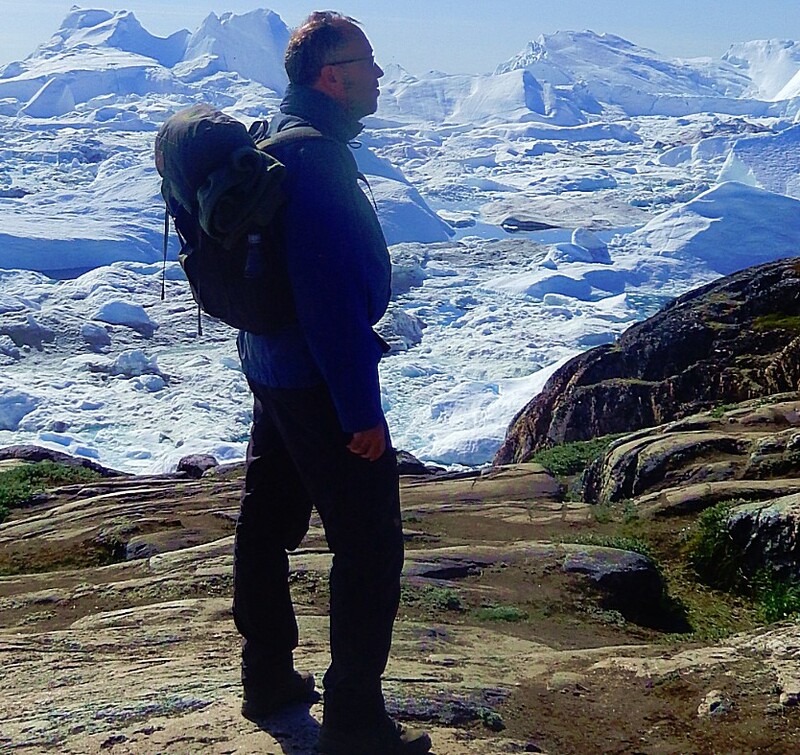 After another great breakfast at Hotel Arctic, which had become a real home to me in these days above the arctic circle, The Wandelgek went on a guided tour walk towards the Kangia/Ilulissat/Jakobshavn fjord and towards the ancient Inuit village of Sermermiut. 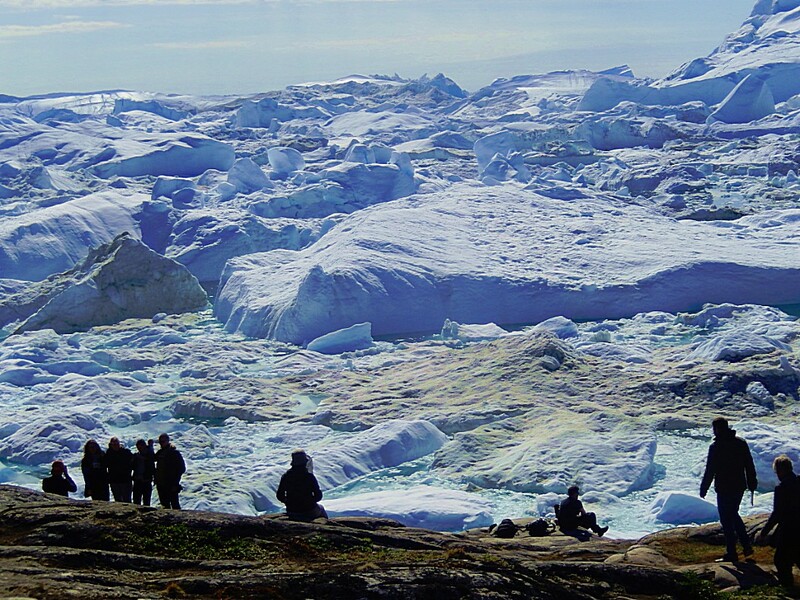 Beautiful icebergs are the setting for the old settlement Sermermiut, located one and a half kilometers south of Ilulissat. 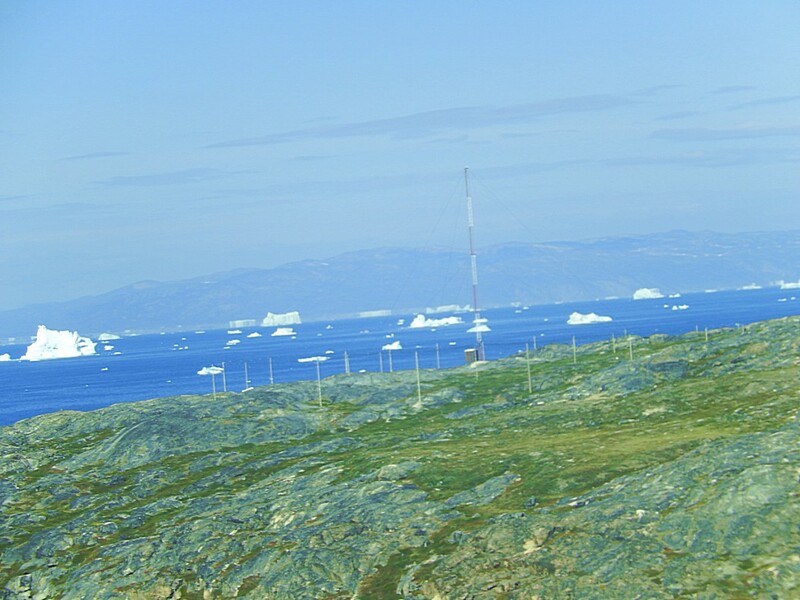 For 4000 years, different Inuit cultures lived in the settlement and today I saw many remains that indicate their presence. 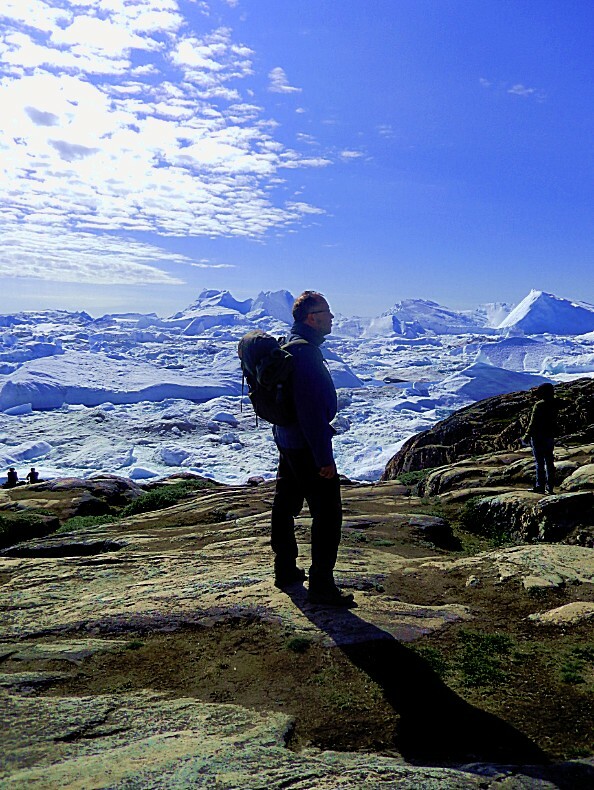 A trip to Sermermiut is an absolute must when visiting Ilulissat, the guide told stories about Inuit people’s life and traditions before the Europeans came to Greenland. There were turf hut ruins to see and it was possible to touch the permafrost with my own hands. I followed the walkway to the viewpoint at Nakkaavik – “the place to fall” (Old Ladies Gorge) and the guide served tea or coffee while I could enjoy the view. 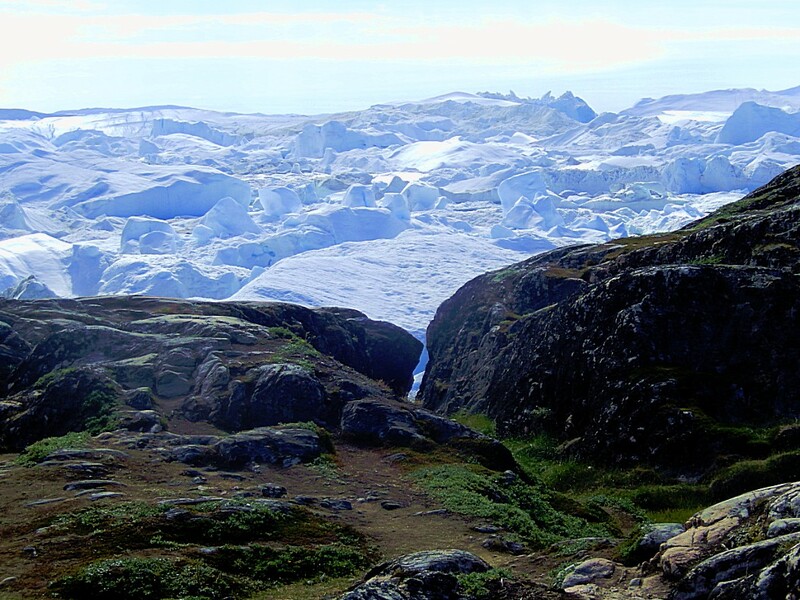 Sermermiut was an Inuit settlement in the Disko Bay, Greenland. 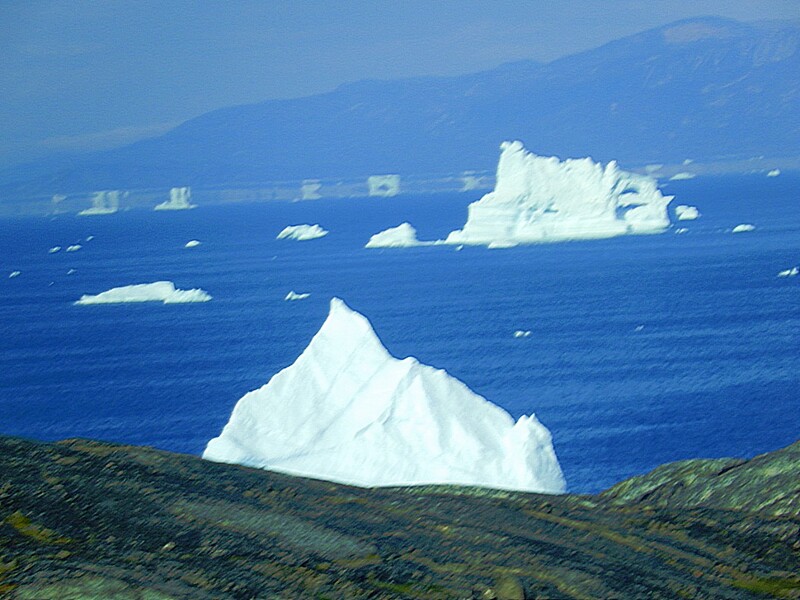 The location is now part of the Ilulissat Icefjord World Heritage Site. 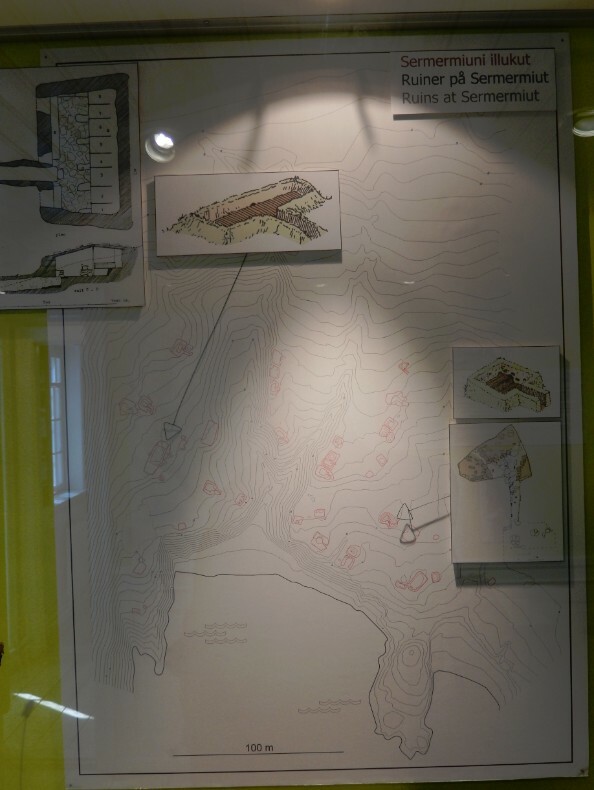 The pre-colonial history of Sermermiut was pieced together by a series of archaeological excavations during the twentieth century. The area became an area of archaeological interest at the start of the century, although the results were not well documented. 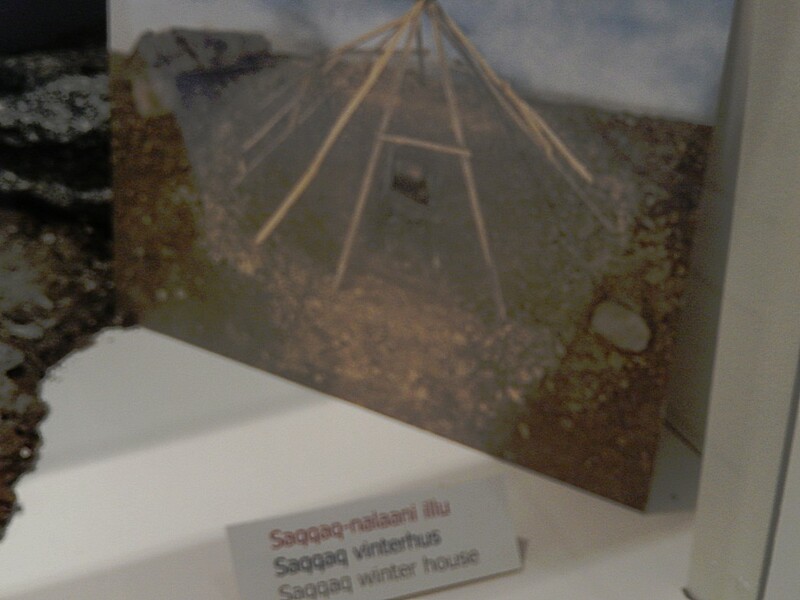 A 1953 dig identified that Sermermiut had been used by Saqqaq, Early Dorset and Thule cultures. 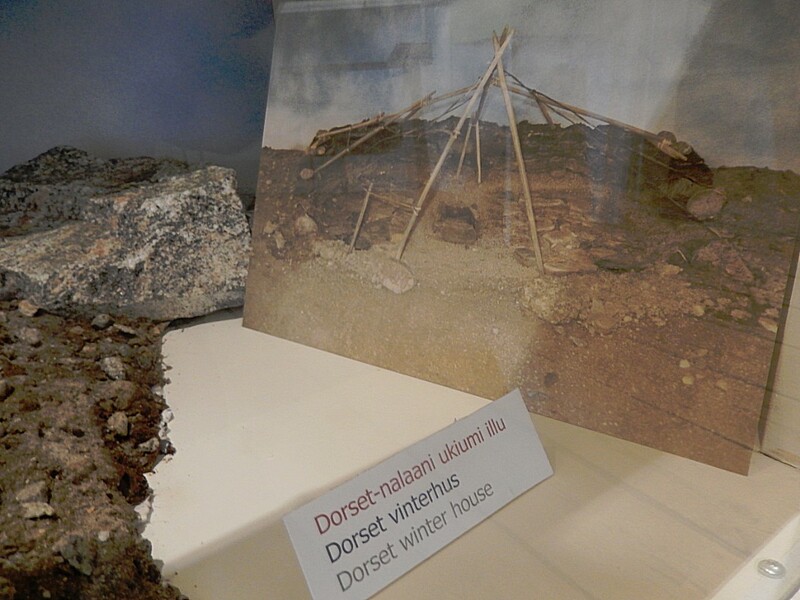 Another dig in 1983 dated the start of the Early Dorset settlement at around 600–200 BCE. 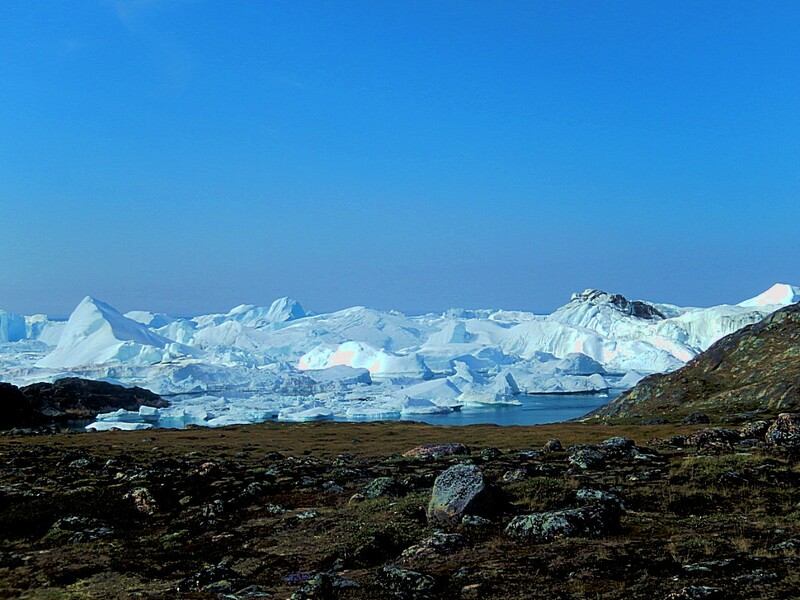 The Saqqaq culture (named after the Saqqaq settlement, the site of many archaeological finds) was a Paleo-Eskimo culture in southern Greenland. 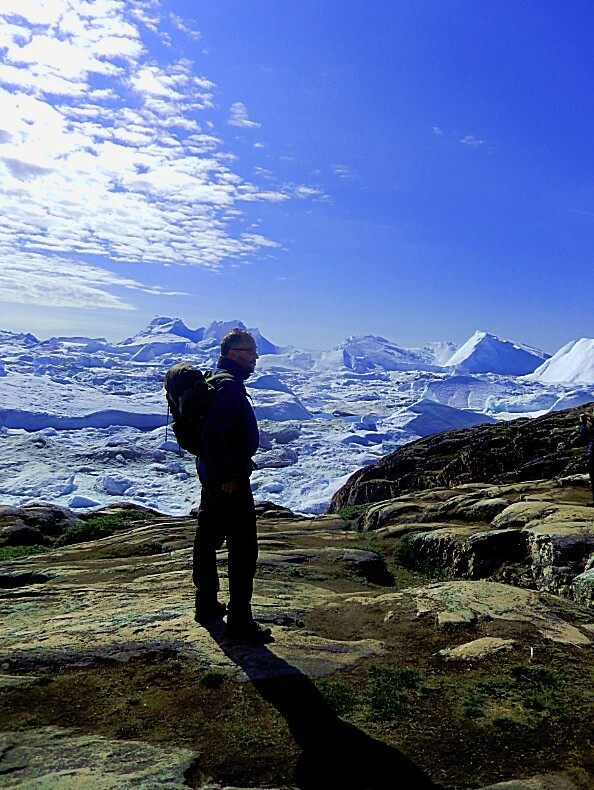 Up to this day, no other people seem to have lived in Greenland continually for as long as the Saqqaq. 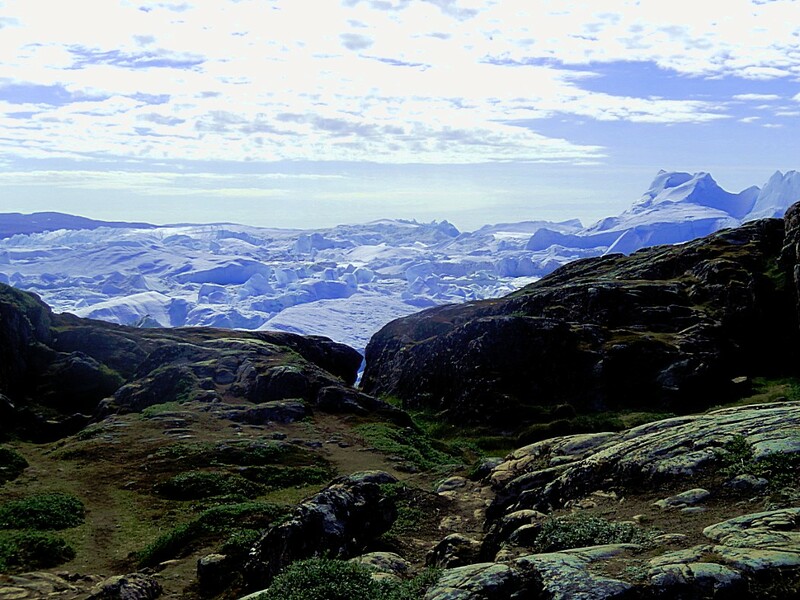 The earliest known archaeological culture in southern Greenland, the Saqqaq existed from around 2500 BCE until about 800 BCE. This culture coexisted with the Independence I culture of northern Greenland, which developed around 2400 BCE and lasted until about 1300 BCE. 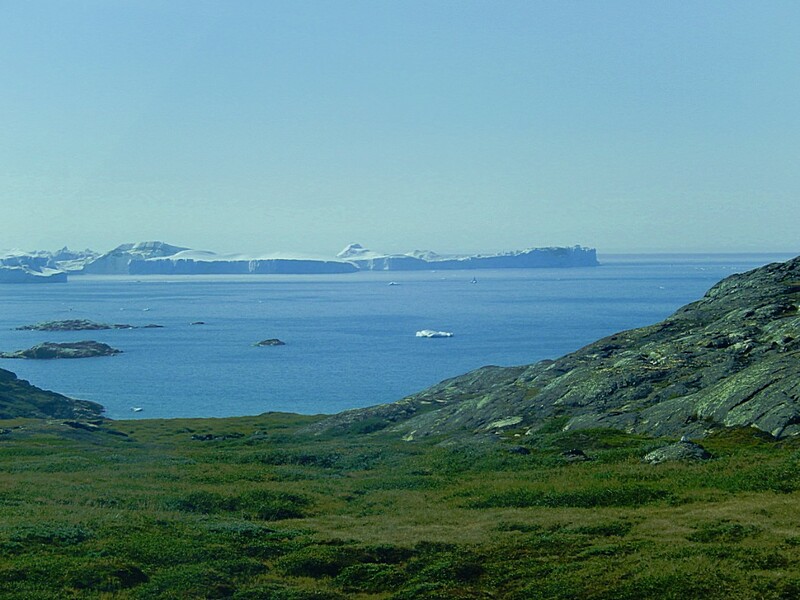 After the Saqqaq culture disappeared, the Independence II culture of northern Greenland and the Early Dorset culture of West Greenland emerged. 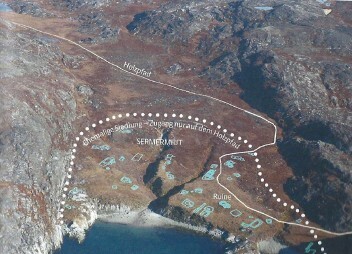 There is some debate about the timeframe of the transition from Saqqaq culture to Early Dorset in western Greenland. The Saqqaq culture came in two phases, the main difference of the two being that the newer phase adapted the use of sandstone. The younger phase of the Saqqaq culture coincides with the oldest phase of the Dorset culture. 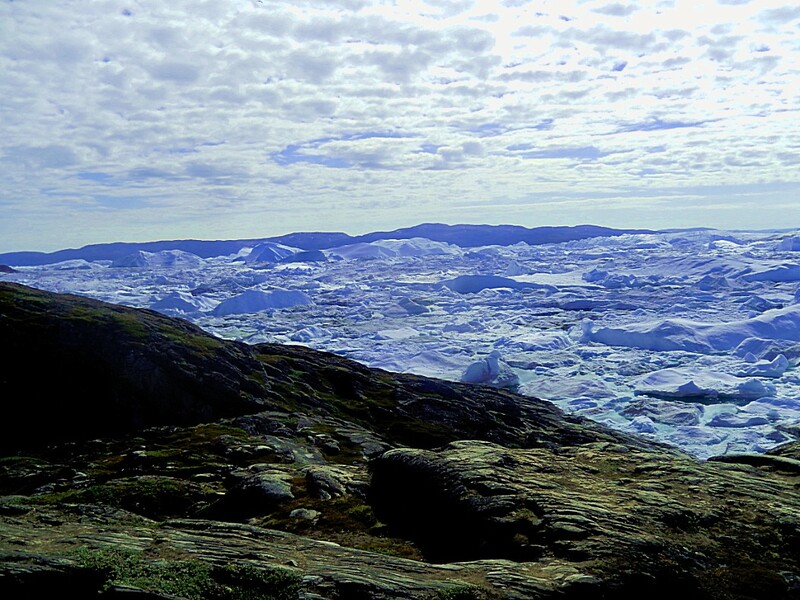 Frozen remains of a Saqqaq dubbed “Inuk” were found in western Greenland (Qeqertarsuaq) and have been DNA sequenced. He had brown eyes, black hair, and shovel-shaped teeth. It has been determined that he lived about 4000 years ago, and was related to native populations in northeastern Siberia. The Saqqaq people are not the ancestors of contemporary Kalaallit people, but instead are related to modern Chukchi and Koryak peoples. It is not known whether they crossed in boats or over ice. 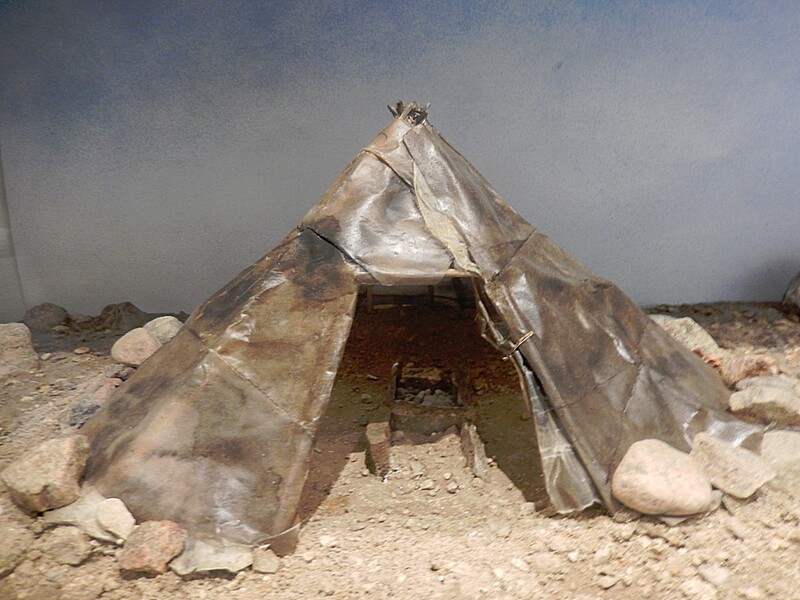 Saqqaq people lived in small tents and hunted seals, seabirds, and other marine animals. The people of the Saqqaq culture used silicified slate, agate, quartzite, and rock crystals as materials for their tools. Inuit legends recount them encountering people they called the Tuniit (singular Tuniq) or Sivullirmiut “First Inhabitants”. According to legend, the First Inhabitants were giants, taller and stronger than the Inuit but afraid to interact and “easily put to flight.” There is also a theory of contact and trade between the Dorset and the Norse. In 1925 anthropologist Diamond Jenness received some odd artifacts from Cape Dorset. As they were quite different from those of the Inuit, he speculated that they were indicative of an ancient, preceding culture. Jenness named the culture “Dorset” after the location of the find. These artifacts showed a consistent and distinct cultural pattern that included sophisticated art distinct from that of the Inuit. For example, the carvings featured uniquely large hairstyles for women, and figures of both sexes wearing hoodless parkas with large, tall collars. Much research since then has revealed many details of the Dorset people and their culture. The Thule or proto-Inuitwere the ancestors of all modern Inuit. They developed in coastal Alaska by 1000 and expanded eastwards across Canada, reaching Greenland by the 13th century. In the process, they replaced people of the earlier Dorset culture that had previously inhabited the region. 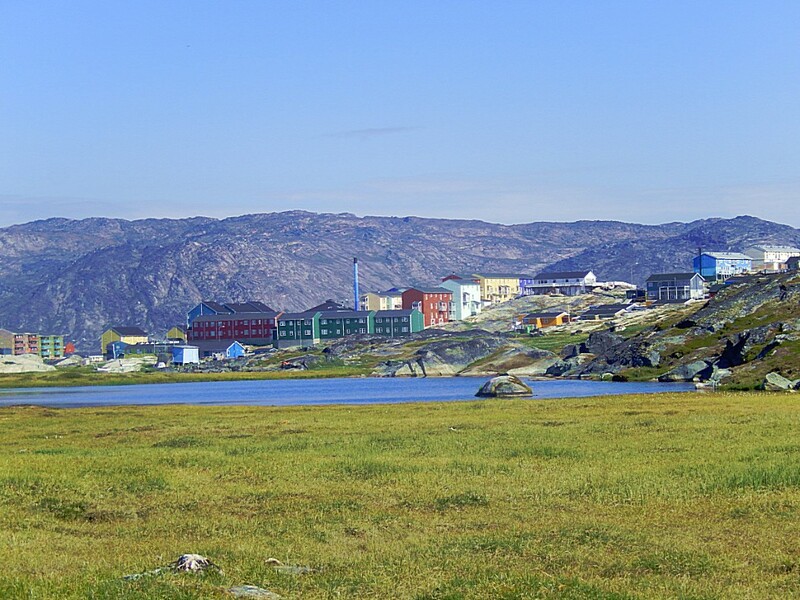 The appellation “Thule” originates from the location of Thule (relocated and renamed Qaanaaq in 1953) in northwest Greenland, facing Canada, where the archaeological remains of the people were first found at Comer’s Midden. 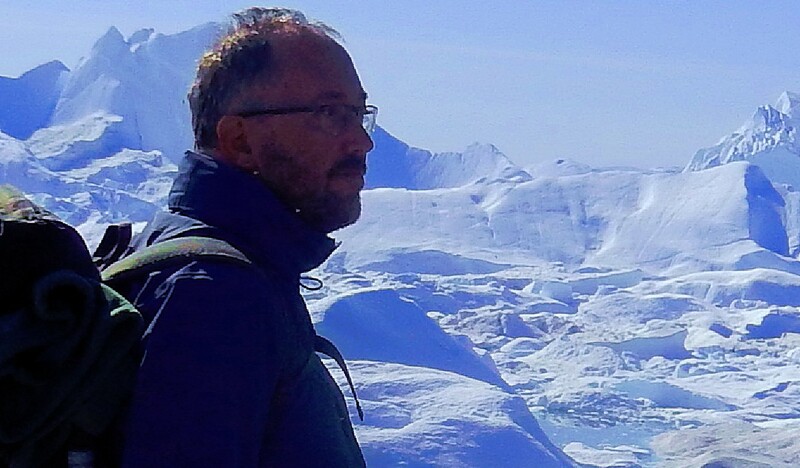 The links between the Thule and the Inuit are biological, cultural, and linguistic. Evidence supports the idea that the Thule (and also the Dorset, but to a lesser degree) were in contact with the Vikings, who had reached the shores of Canada in the 11th century. In Viking sources, these peoples are called the Skræling. 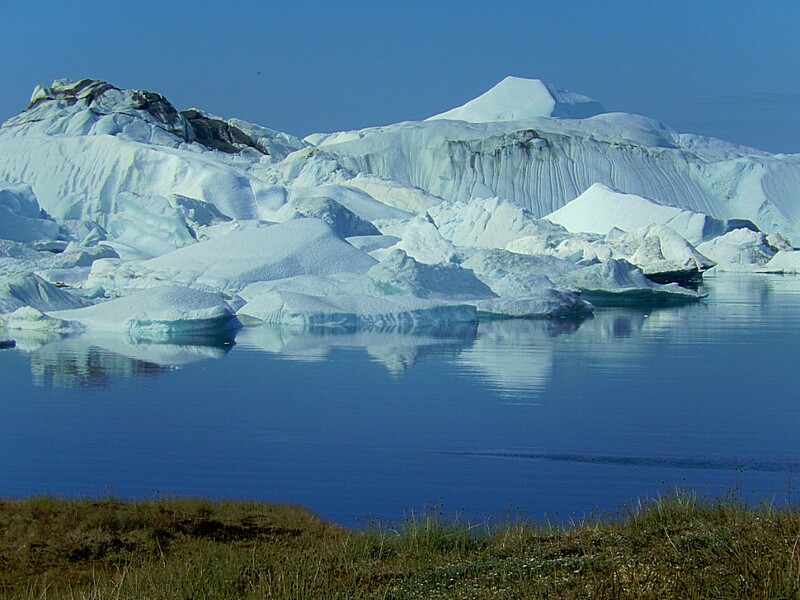 Some Thule migrated southward, in the “Second Expansion” or “Second Phase”. By the 13th or 14th century, the Thule had occupied an area currently inhabited by the Central Inuit, and by the 15th century, the Thule replaced the Dorset. Intensified contacts with Europeans began in the 18th century. Compounded by the already disruptive effects of the “Little Ice Age” (1650–1850), the Thule communities broke apart, and the people were henceforward known as the Eskimo, and later, Inuit. 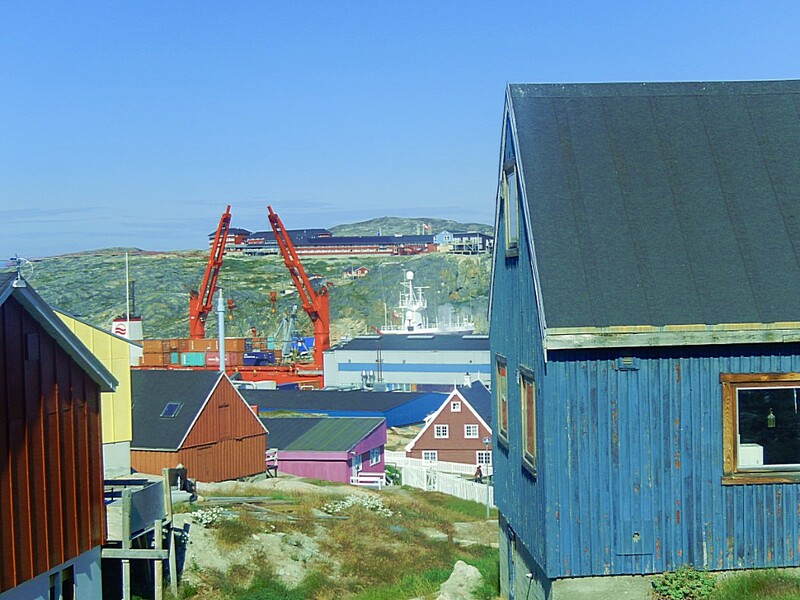 Sermermiut was abandoned in 1850 when the last resident moved to nearby Jakobshavn (now renamed Ilulissat). 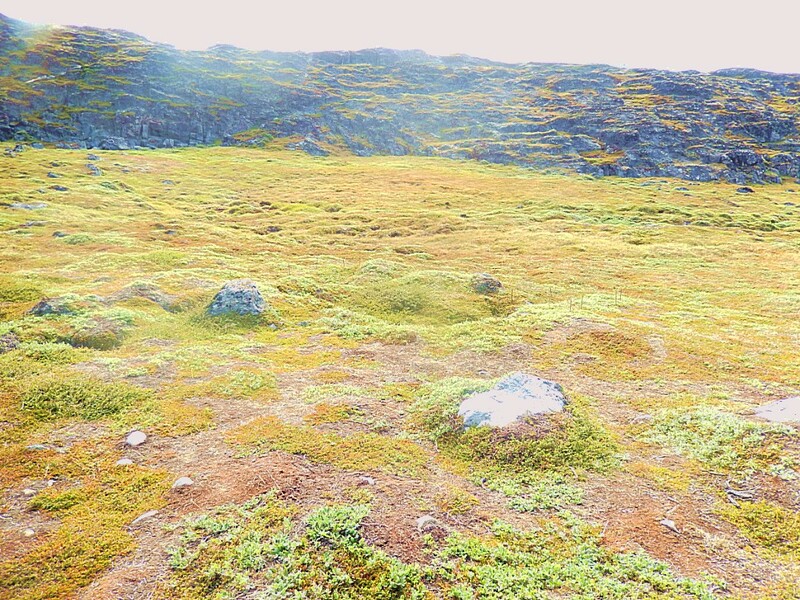 There were many holes and fissures in the mossy surface and I could stick a hand and an arm deep into the surface and actually feel the cold frozen permafrost layer below. The underground never melts, well… except of course when climate change does. In this frozen underground are lots of plant remains, which start rotting if they unfreeze and they release gas which will heat up the earth even more and even faster… Another reason to not let this happen. …not much to see, except for the keen eagle eye scout, who can spot some small sticks surrounding a grassy hill. 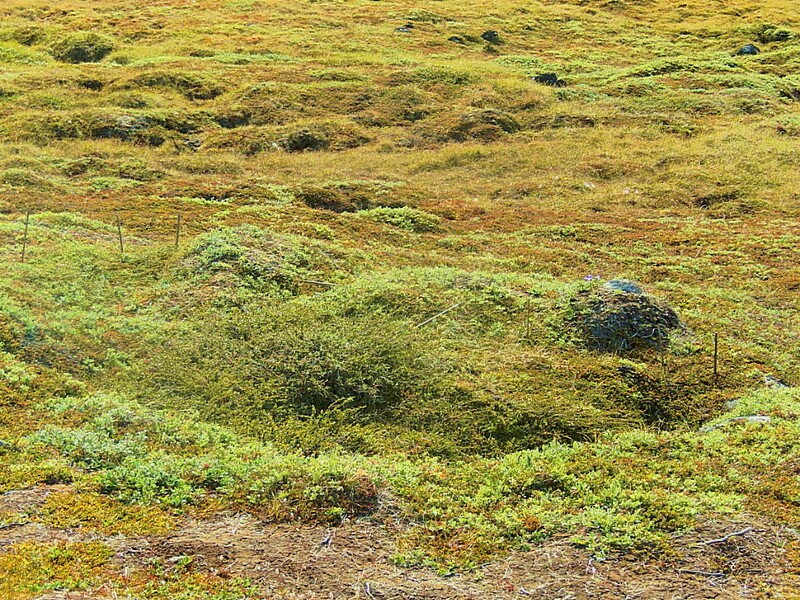 This grassy hill was actually a Sermermiut hut, a home to tribe members living here at the verge of the fjord. 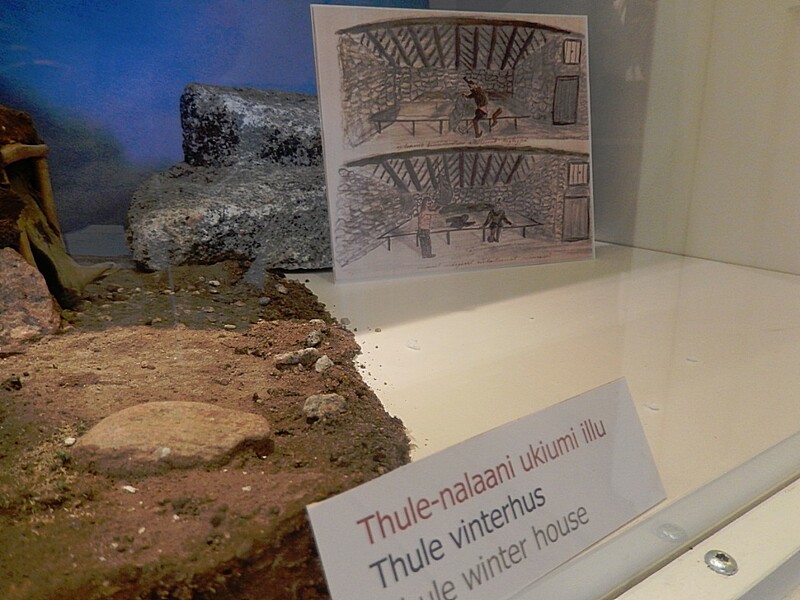 These houses found, were the Thule period houses as shown earlier. 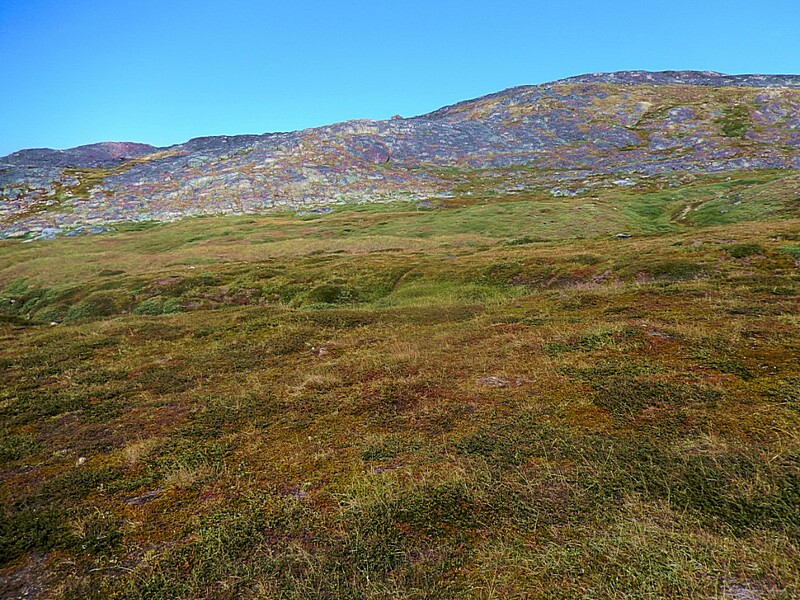 There are about 40 Turf house ruins in Sermermiut, but you can hardly see them. 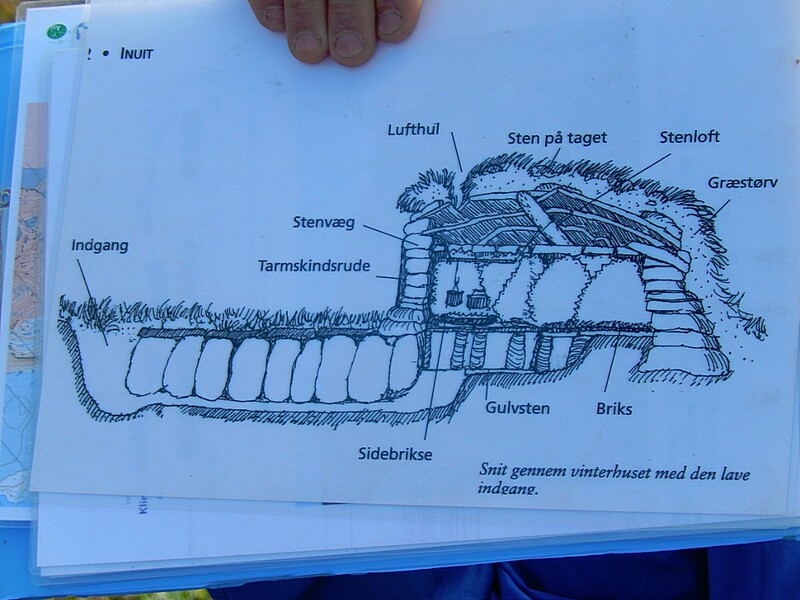 Most of these ruins originate from the Thule culture, where the current Greenlandic Inuit population is descending from. The Turf houses made of stone and turf had a roof construction made out of driftwood and whale bones. 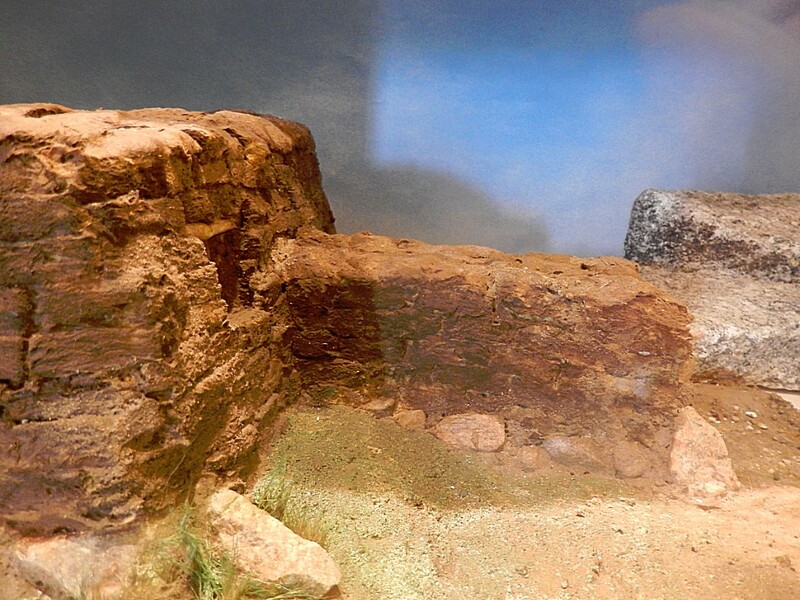 The entrance was dug deeper than the actual house, to prevent the warmth created by the whale-oil lamp getting lost. 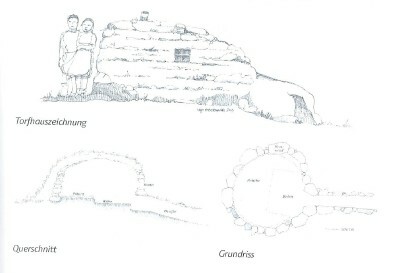 The oldest houses from the Thule culture were small and round. In the timespan between 1700 and 1800 after Chr., multiple families lived in large houses, but around 1900 again only one familie lived in a house, but these later houses were square and trapezium shaped. Purely seen from an economic point of view, the turf houses were good, because they didn’t require any real investment, and it was possible to keep following the animals of prey. People stayed mobile. 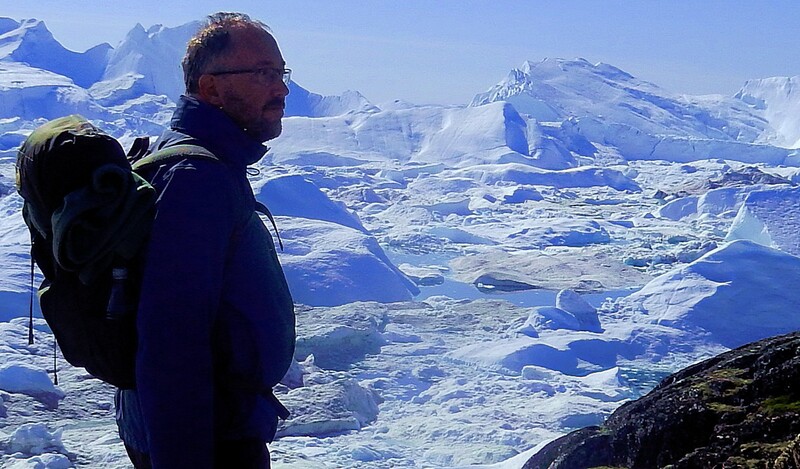 We ended our visit to Sermermiut at he coast of the Kangia icefjord, the reason why the village of Sermermiut was located her in the first place. 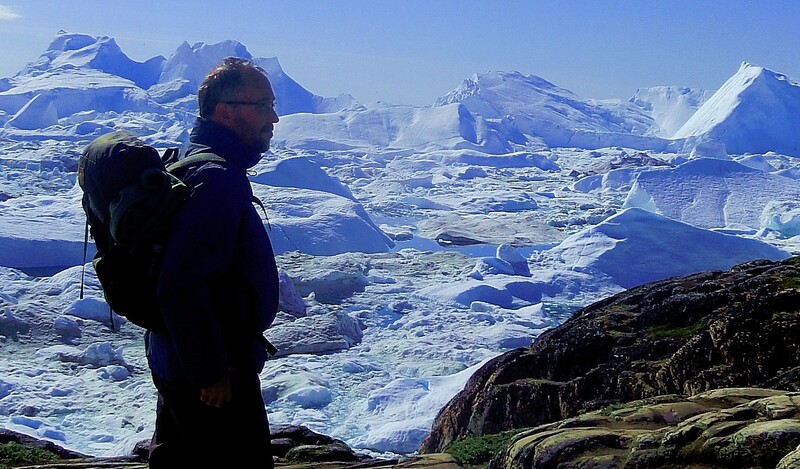 The Kangia/Ilulissat/Jakobshavn icefjord is enormously rich with fish and other possible prey, because the melting ice brings extremely nutritious water to the surface. 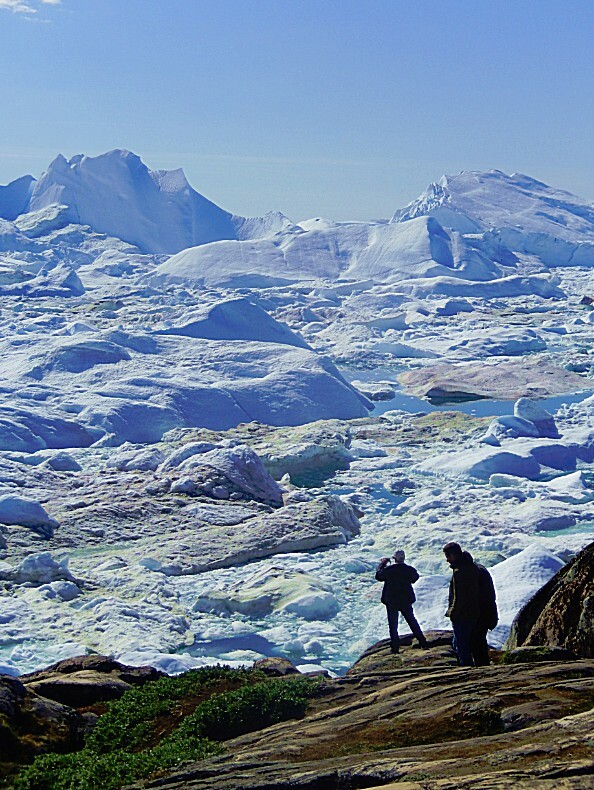 In the Arctic, Inuit people survived thousands of years using natural resources. 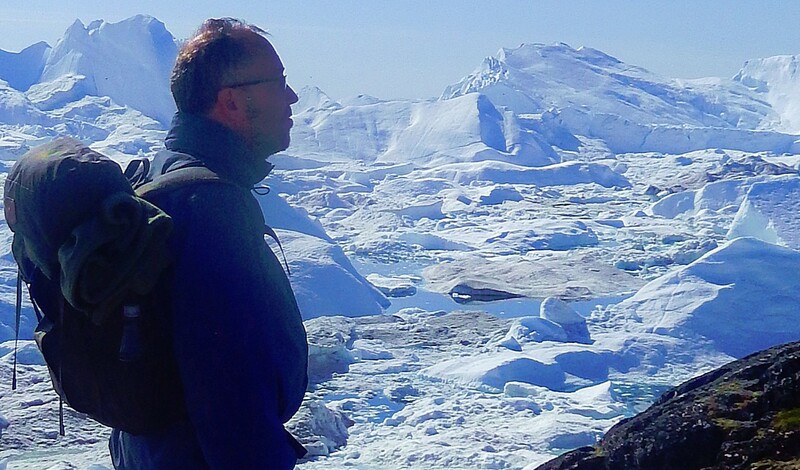 At the icefjord, the sea is extremely plentiful with animals, because the melting icebergs stir the seawater which brings the deep cold but very nutritious water to the surface. 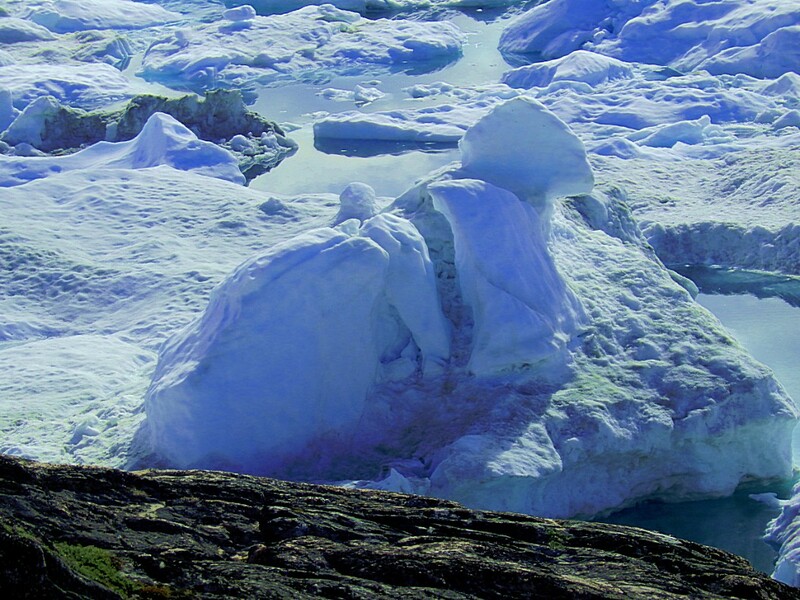 That’s why Sea mammals and fish are present in huge numbers at the mouth of the icefjord. That’s also why this area is the most kozentrated fishing ground in the whole north Atlantic. There are not many mammals on dry land though, because the strip of land between the coast and the barren inland ice is just about 40 kilometres wide. 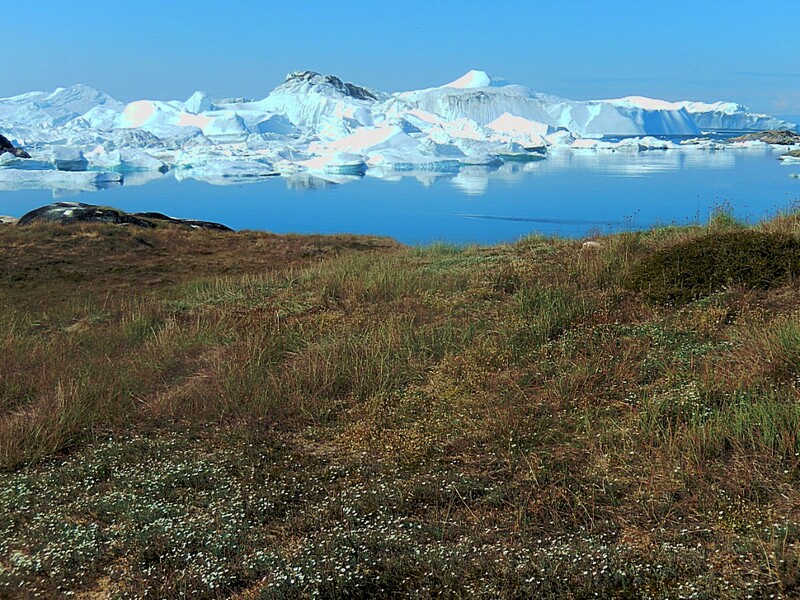 There are a few arctic foxes, hares or musk oxes and reindeer/karibou to spot, mainly on the south side of the fjord. During winter, people lived in Sermermiut and in summer people went to the summer hunting areas. The Seal was vital for the survival of people at Sermermiut. 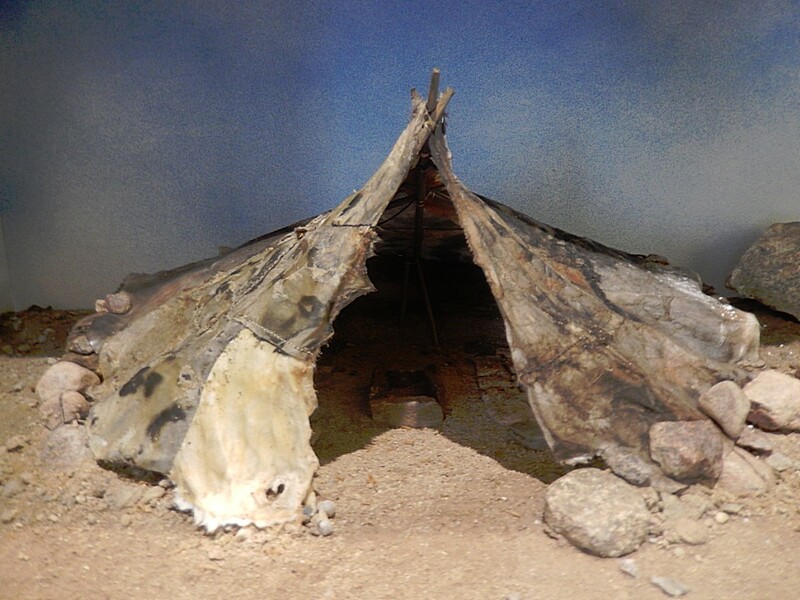 The Seal provided everything which was vital for survival: cloths, food, heat, light and (building) materials. About 1850 people left Sermermiut for the last time. 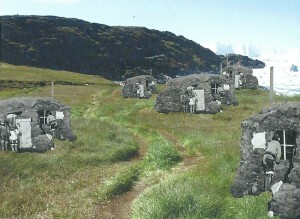 The nearby settlement of Jakobshavn (founded in 1741) attracted a lot of its inhabitants. At the same time the climate had changed and for a few hundred years, until 1850, it was extremely cold. This timespan became kniwn as “the small Ice Age”. 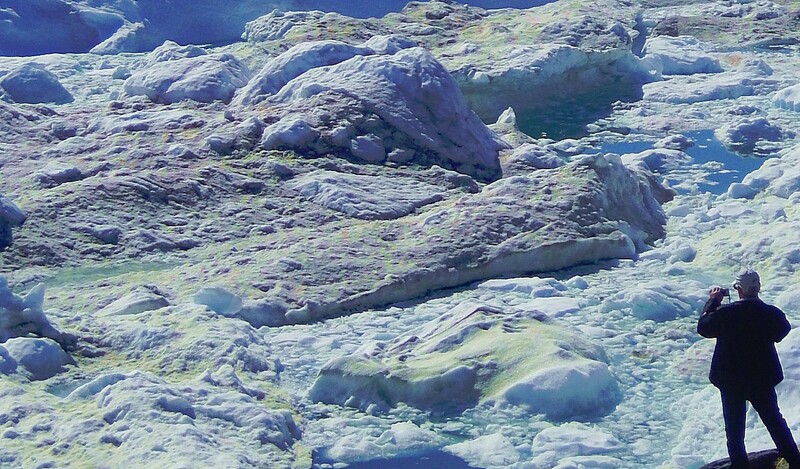 Because of this, the glacier front had moved extremely fast and deep forward into Disco Bay, which could have led to problems caused by the ice, blocking the entrance to the village. At the very end of the wooden UNESCO trail The Wandelgek arrived at the Old Wives Gap (a chasm in the rocky coast) where old women from Sermermiut went to to throw themselves of the cliffs onto the rocks and ice or into the cold water to die and stop being a burden to the community. Gruesome but the reality of living in such a harsh environment. 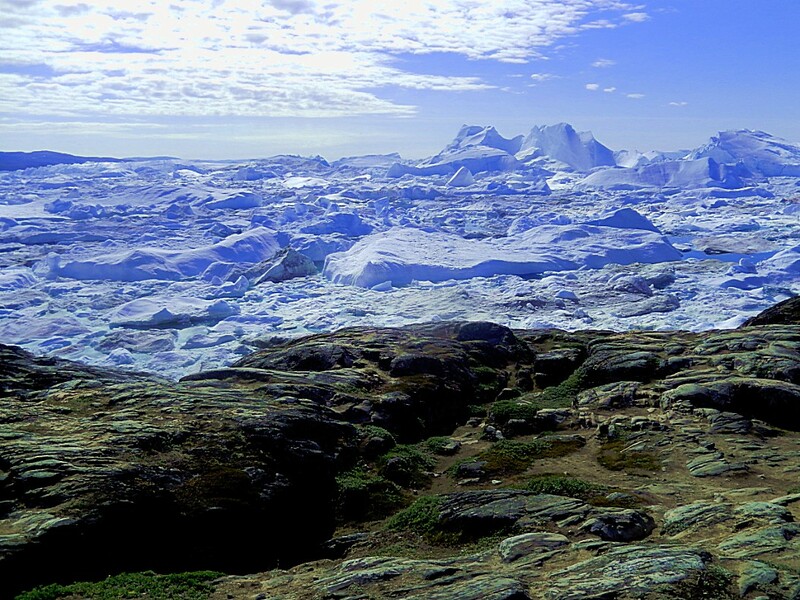 The route back to Ilulissat was identical to the roate towards. 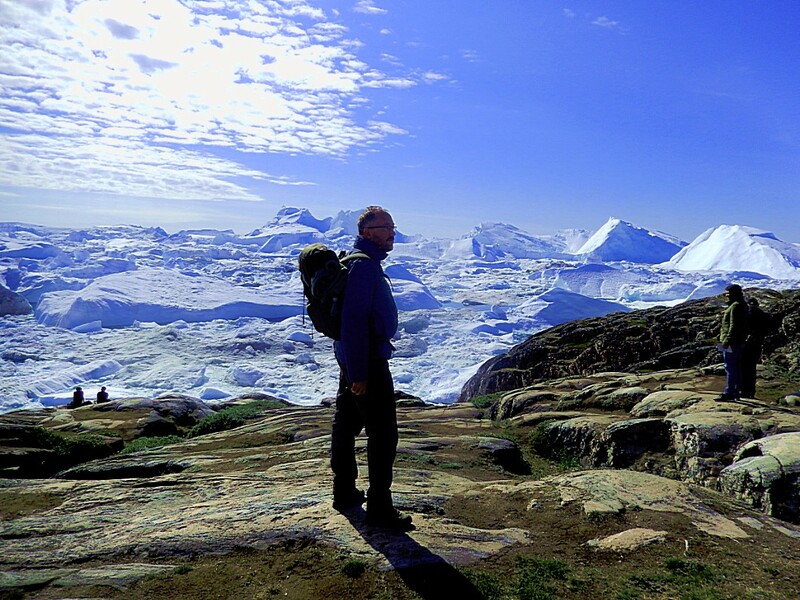 The Wandelgek walked through the outskirts of Ilulissat towards the city centre. 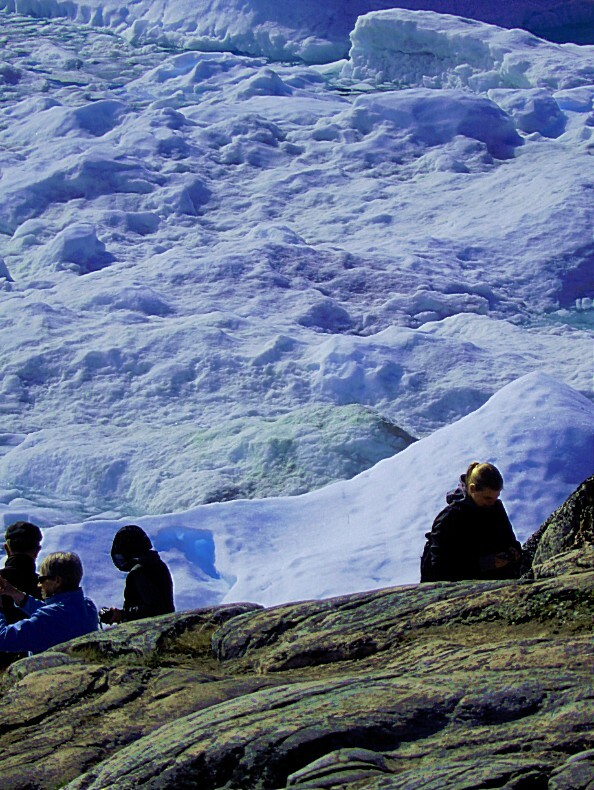 The guided tour ended at the blue office of World of Greenland right on time to take a minibus to the airport.